Greetings Whatcom County Small Farm Expo Exhibitors! 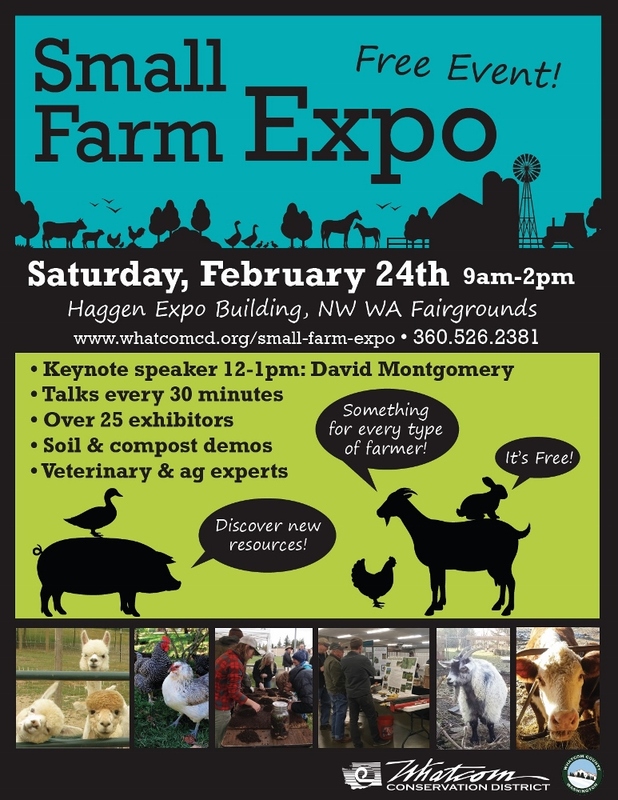 The third annual Whatcom County Small Farm Expo is coming up in just one month, on Saturday February 24th, from 9 a.m. to 2 p.m. We have had a tremendous amount of interest on our website and Facebook Event and we expect a good turn out! Please continue to promote the event in any way you can. Click Here for a poster for printing and forwarding. Let me know if you would like copies mailed to you – Katie Pencke 360-526-2381 x 105. Sponsors: Thanks to our 2018 Small Farm Expo sponsors! CHS, Coastal Realty, Country Financial, Grow Northwest, Scratch & Peck, and Whatcom Family Farmers. Payment: Exhibitor payment due by February 15, 2018. Make checks out to Whatcom Conservation District and mail to: 6975 Hannegan Road, Lynden, WA 98264. To pay with credit card over the phone call Katie Pencke. 360-526-2381 x 105. Whatcom county Small Farm Expo is Saturday February 24, 2018 from 9 a.m. to 2 p.m.
Exhibitor setup is Friday February 23 from 2-3:30 p.m. or Saturday February 24 from 7 to 8:45 a.m. Please be completely set up by 8:45 a.m.
For those of you bringing farm equipment, please plan to load in Friday February 23 in the late afternoon. NW Washington Fairground, 1775 Front St, Lynden, WA 98264 (there will be signs on Front St). There is ample parking to the south and west of the venue. For set-up, feel free to pull up to the roll-up doors on the south side of building. Please unload quickly then move your vehicle to the parking lot to the west to save room for participants. Expo staff will help with directing you as needed. Each exhibitor will have an 8 ft table. We will provide a map of the space with your location when you arrive. There is WiFi in and around the building if needed. There will be electrical hookups available for those who have requested it. Food will be available for sale at the event from Good to Go Meat Pies, as well as a coffee and tea concession to benefit a local youth group. We have a great line up of nine presenters this year, including veterinarians, pasture management specialists, orchardists and financial resources, and will have that schedule out to you soon.